Here Come the Donkeys ! We hope you will enjoy meeting our donkeys. Visit our BLOGSPOT which has our latest news. Click 'Subscribe by email' to receive an email when the Blog is updated. Leave us a comment or message if you like. and a chat room for us to talk donkeys . Please return from time to time. Hopefully there will be new features. We are planning a chat room for us to talk donkeys and a gift shop. Our latest addition is our BLOGSPOT which has our latest news and comments from our friends. As we have LOTS of donkey photographs we will change the pictures sometimes too. 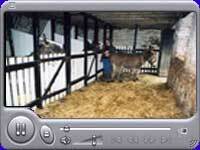 Right-Click here to download the video clip of the Welcome the donkeys give us every morning. If the video or sound does not play your browser may need a plug-in player.